Control power transformers are an important component to proper starter control. High voltage motors are typically controlled with low (or lower) voltage control circuits for safety. These transformers convert very high voltages into safe working control voltage levels. The transformers that are installed in EMSCO starters are dual-fused on the primary voltage (high voltsge) side and single fused on the secondary voltage (low voltage) side. 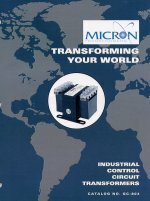 EMSCO is an authorized distributor and reseller of MICRON TRANSFORMERS. We are our own best customer!!! We can work with you in selecting the proper transformer for your application. 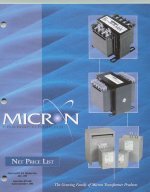 EMSCO carries a large selection of MICRON transformers in stock .